The Japan Mint (独立行政法人 造幣局, Dokuritsu Gyōsei Hōjin Zōheikyoku) is an Incorporated Administrative Agency. It is a special type of semi-governmental entity in Japan. The mint has its Head office in Osaka with branches in Tokyo and Hiroshima. 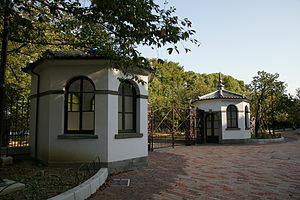 The Meiji government established the Japan Mint. In the early Meiji era, paper currency was printed by Dondorf and Naumann in Germany. A proposal to construct a banknote manufacturing plant in Japan was approved in December 1874. A two-story Western red brick building was completed in October 1876. The Mint became an Incorporated Administrative Agency on April 1, 2003. ↑ 独立行政法人一覧 ("The List of Independent Administrative Institutions"), 2009; retrieved 2012-2-4. ↑ Boling, Joseph E. "Building a National Currency -- Japan, 1868-1899," 1996. ↑ National Archives of Japan, Digital Gallery, Drawings, Japan Mint; retrieved 2012-2-9. This page was last changed on 19 March 2013, at 23:23.